This little stinky tofu spot in Yuli had people lining up to get their fix when they opened each afternoon. 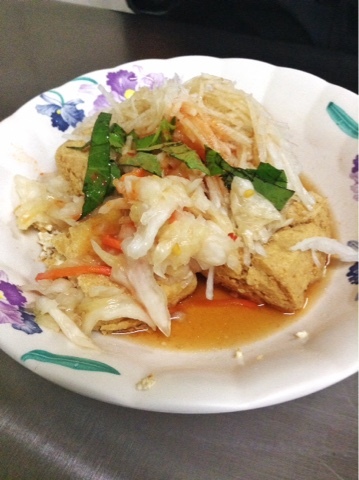 Stinky tofu is a Taiwanese delicacy wherein tofu is fermented slightly and takes on a stinky cheese-like savoriness. The version in Yuli is somewhat less far gone than the sharp Chou Doufu in Taipei, which fills the night markets with its heady reek. The stuff is fantastic, served with cabbage and pickled ginger and basil in a sweet sauce. The cubes of funk are crispy fried on the outside and meltingly soft within. One of the great foods of Taiwan. Don't let the smell deter you.